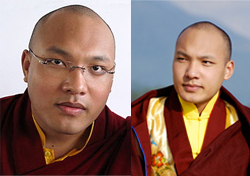 A huge controversy of strategic dimension broke out in 2000 with the escape of 17th Karmapa -- Urgyen Trinley Dorje -- from Tibet with the aim to reach Rumtek Monastery in Sikkim. Trinley Dorje has the blessings of Tibetan spiritual leader Dalai Lama and was accepted as a tulku (lama reincarnate) by the Chinese government too. Chinese authorities were not able to raise any strong objections over the asylum given to the Karmapa by India as it would be an explicit approval of Sikkim's merger with Indian union. For at that time, China still maintained Sikkim as an independent state under forceful occupation by India. However, the Chinese government recognised Sikkim as an Indian state in 2003 on the condition that India officially recognises Tibet as part of China. It is to be noted that New Delhi had long back accepted Tibet as a part of China in 1953 during the government of Jawaharlal Nehru. 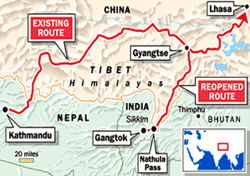 The 2003 agreement on Sikkim and Tibet led to a thaw in Sino-Indian relations. On 6 July 2006, the Sikkimese Himalayan pass of Nathu La was opened to cross-border trade. Nathu La pass became the first open border between India and China. The Nathu La pass, which had been closed since the 1962 Sino-Indian War, was once part of the ancient Silk Road. On 18 September 2011, a magnitude 6.9 MMS (moment magnitude scale) earthquake struck Sikkim, killing at least 116 people in the state and in Nepal, Bhutan, Bangladesh and Tibet. More than 60 people had died in Sikkim alone in the massive temblor. The capital Gangtok bore a significant damage as its civic infrastructure was the worst hit in the natural disaster. 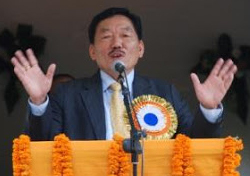 Charismatic leader Pawan Chamling became the Chief Minister of Sikkim for the fifth time in a row after the assembly elections in May 2014. His party Sikkim Democratic Front (SDF) swept the assembly polls by winning 22 of the 32 seats in this tiny Himalayan state. With the ruling SDF winning the assembly polls for the consecutive fifth time, its chief Pawan Chamling has broken the record of the longest serving CM in the country. Chamling became the CM of Sikkim for the first time on December 12, 1994 and has continued to rule the state for more than 20 years now. He is the only political leader in the country poised to celebrate silver jubilee as CM, thus breaking the record of late Communist leader Jyoti Basu, who remained chief minister of West Bengal for 23 consecutive years from June 21, 1977 to November 5, 2000. The SDF led by Chamling won the assembly election, which was carried out simultaneously with the Lok Sabha election, by securing 22 of the 32-seat assembly. The party got majority 55% vote share in multi-corned contest in Sikkim. Contesting the assembly polls from Rangang-yangang and Namchi-singhithang, Chamling won with a huge margin. The SDF also won the lone Lok Sabha seat when its candidate P.D.Rai defeated main rival Tek Nath Dhakal with approximately 42,000 votes. Chamling was elected to the Sikkim legislative assembly for the first time in 1985. He formed the SDF on March 4, 1993 and swept the polls in the 1994 assembly elections. Since then it has been a dream run for Chamling and his party in the state, which is now a global brand in eco-tourism. Chief Minister Pawan Chamling has set a target to make Sikkim poverty-free by 2017 and at present, it has the lowest percentage of people below the poverty line in the country.